This document is a Specification containing technical details concerning the implementation of the Signalling Data Terminal Interface (SDTI) for OpenSS7. It contains recommendations on software architecture as well as platform and system applicability of the Signalling Data Terminal Interface (SDTI). This document specifies a Signalling Data Terminal Interface (SDTI) Specification in support of the OpenSS7 Signalling Data Terminal (SDT) protocol stacks. It provides abstraction of the signalling data terminal interface to these components as well as providing a basis for signalling data terminal control for other data terminal control protocols. The purpose of this document is to provide technical documentation of the Signalling Data Terminal Interface (SDTI). This document is intended to be included with the OpenSS7 STREAMS software package released by OpenSS7 Corporation . It is intended to assist software developers, maintainers and users of the Signalling Data Terminal Interface (SDTI) with understanding the software architecture and technical interfaces that are made available in the software package. It is the intent of this document that it act as the primary source of information concerning the Signalling Data Terminal Interface (SDTI). This document is intended to provide information for writers of OpenSS7 Signalling Data Terminal Interface (SDTI) applications as well as writers of OpenSS7 Signalling Data Terminal Interface (SDTI) Users. The audience for this document is software developers, maintainers and users and integrators of the Signalling Data Terminal Interface (SDTI). The target audience is developers and users of the OpenSS7 SS7 stack. This document specifies a STREAMS -based kernel-level instantiation of the ITU-T Signalling Data Terminal Interface (SDTI) definition. The Signalling Data Terminal Interface (SDTI) enables the user of a a signalling data terminal service to access and use any of a variety of conforming signalling data terminal providers without specific knowledge of the provider's protocol. The service interface is designed to support any network signalling data terminal protocol and user signalling data terminal protocol. This interface only specifies access to signalling data terminal service providers, and does not address issues concerning signalling data terminal management, protocol performance, and performance analysis tools. This specification assumes that the reader is familiar with ITU-T state machines and signalling data terminal interfaces (e.g. Q.703, Q.2210), and STREAMS . This document specifies an interface that supports the services provided by the Signalling System No. 7 (SS7) for ITU-T, ANSI and ETSI applications as described in ITU-T Recommendation Q.703, ITU-T Recommendation Q.2210, ANSI T1.111.3, ETSI ETS 300 008-1. These specifications are targeted for use by developers and testers of protocol modules that require signalling data terminal service. A SDT-User that initiates a Signalling Data Terminal. A SDT-User with whom an originating SDT user wishes to establish a Signalling Data Terminal. Kernel level protocol or user level application that is accessing the services of the Signalling Data Terminal sub-layer. Signalling Data Terminal sub-layer entity/entities that provide/s the services of the Signalling Data Terminal interface. The Signalling Data Terminal Layer provides the means to manage the association of SDT-Users into connections. It is responsible for the routing and management of data to and from signalling data terminal connections between SDT-user entities. The SDTI defines the services provided by the signalling data terminal layer to the signalling data terminal user at the boundary between the signalling data terminal provider and the signalling data terminal user entity. The interface consists of a set of primitives defined as STREAMS messages that provide access to the signalling data terminal layer services, and are transferred between the SDTS user entity and the SDTS provider. These primitives are of two types; ones that originate from the SDTS user, and other that originate from the SDTS provider. The primitives that originate from the SDTS user make requests to the SDTS provider, or respond to an indication of an event of the SDTS provider. The primitives that originate from the SDTS provider are either confirmations of a request or are indications to the CCS user that an event has occurred. Figure 1 shows the model of the SDTI. The SDTI allows the SDTS provider to be configured with any signalling data terminal layer user (such as a signalling link application) that also conforms to the SDTI. A signalling data terminal layer user can also be a user program that conforms to the SDTI and accesses the SDTS provider via putmsg(2s) and getmsg(2s) system calls. The typical configuration, however, is to place a signalling link module above the signalling data terminal layer. The features of the SDTI are defined in terms of the services provided by the SDTS provider, and the individual primitives that may flow between the SDTS user and the SDTS provider. The SDTI Services are broken into two groups: local management services and protocol services. Local management services are responsible for the local management of streams, assignment of streams to physical points of attachment, enabling and disabling of streams, management of options associated with a stream, and general acknowledgement and event reporting for the stream. Protocol services consist of connecting a stream to a medium, exchanging data with the medium, and disconnecting the stream from the medium. The protocol services interface is described in Protocol Services, and the primitives are detailed in Protocol Service Primitives. The protocol services interface is defined by the ss7/sdti.h header file (see SDTI Header File Listing). The SDTI is typically implemented as a device driver controlling a MPCC (Multi-Protocol Controller Chip) device that provides access to channels. The purpose behind exposing this low level interface is that almost all communications channel devices can be placed into a SS7 HDLC mode, where a data stream can be exchanged between the driver and the medium. The SDTI provides and inteface that, once implemented as a driver for a new device, can provide complete and verified SS7 signalling link capabilities by pushing generic SL (Signalling Link) modules over an open device stream. This allows SL modules to be verified independently for correct operation and then simply used for all manner of new device drivers that can implement the SDTI interface. Protocol services are specific to the Signalling Data Terminal interface. These services consist of connection services that permit the transmit and receive directions to be connected to or disconnected from the medium, and data transfer services that permit the exchange of data between SDTS users. The power on service provides the SDTS user with the ability to power up the receive and trasmitters associated with the medium. Transmitters and receivers can be powered up independently. Data trasnfer cannot occur until the transmitters or receivers have been powered up. SDT_DAEDT_START_REQ: This service primitive allows the SDTS user to request that transmission of bits begin on the medium. SDT_DAEDR_START_REQ: This service primitive allows the SDTS user to request that receiption of bits from the medium begin. The data transfer service provides the SDTS user with the ability to exchange signal units with the SDTS provider. Signal units may be sent to the SDTS provider for transmission and received signal units are delivered to the SDTS user by the SDTS provider. Timing queues can also be indicated by the SDTS provider. SDT_DAEDT_TRANSMISSION_REQ: This service primitive allows the SDTS user to request the transmission of a signal unit. SDT_RC_SIGNAL_UNIT_IND: This service primitive allows the SDTS provider to indicate when a signal unit has been received. SDT_TXC_TRANSMISSION_REQUEST_IND: This service primitive allows the SDTS provider to indicate when it is idle (that is, it is requesting transmission). The initial alignment service provides for all of the mechanisms associated with the Alignment Error Rate Monitor (AERM). This includes the ability for the SDTS user to start and stop the AERM, set the proving period to either normal proving or emergency proving, to receive correct signal unit indications and indications of when the error rate exceeds the configured threshold. SDT_AERM_START_REQ: This service primitive allows the SDTS user to request that the ERM for alignment be started. This is normally performed when initial alignment begins on the signalling link. SDT_AERM_SET_TI_TO_TIN_REQ: This service primitive allows the SDTS user to request that the ERM for alignment use the error threshold values for normal alignment. SDT_AERM_SET_TI_TO_TIE_REQ: This service primitive allows the SDTS user to request that the ERM for alignment use the error threshold values for emergency alignment. SDT_IAC_CORRECT_SU_IND: This service primitive allows the SDTS provider to indicate when a signal unit has sucessfully been received during initial alignment. SDT_IAC_ABORT_PROVING_IND: This service primitive allows the SDTS provider to indicate when the Alignment Error Rate Monitor (AERM) exceeds it threshold. SDT_AERM_STOP_REQ: This service primitive allows the SDTS user to request that the ERM for alignment be stopped. This is normally performed when initial alignement ends for the signalling link. The error rate monitoring service provides all of the mechanisms associated with the Signal Unit Error Rate Monitor (SUERM) or Errored Interval Monitor (EIM). This includes the ability for the SDTS user to start and stop the SUERM/EIM, and be notified when the error rate exceeds the configured threshold. SDT_SUERM_START_REQ: This service primitive allows the SDTS user to request that the ERM for normal operation be started. This is normally performed when intial alignment ends for the signalling link. SDT_LSC_LINK_FAILURE_IND: This service primitive allows the SDTS provider to indicate when the Signal Unit Error Rate Monitor (SUERM) exceeds its threshold. SDT_SUERM_STOP_REQ: This service primitive allows the SDTS user to request that the ERM for normal operation be stopped. This is normally performed when initial alignment begins for the signalling link. The receive congestion service providers mechanisms to implement provider-specific receive congestion indications to the SDTS user. SDT_RC_CONGESTION_ACCEPT_IND: This service primitive allows the SDTS provider to indicate when receive congestion has onset, but not to the point that it is dicarding signal units. 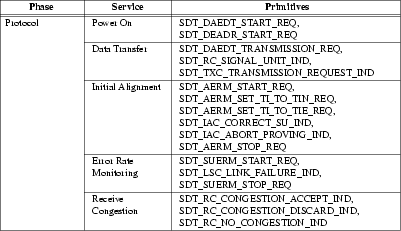 SDT_RC_CONGESTION_DISCARD_IND: This service primitive allows the SDTS provider to indicate when receive congestion has onset, and signal units are being dicarded. SDT_RC_NO_CONGESTION_IND: This service primitive allows the SDTS provider to indicate when receive congestion abates. The protocol service primitives implement the services of the DAEDT, DAEDR, AERM, SUERM/EIM and a provider specific receive congestion function, including power on, initial alignment support, error rate monitoring, receive cnogestion detection, and data transfer. The power on service primitives provide the ability for the SDTS user to power on the DAEDR and DAEDT functions within the SDTS provider. These service primitives implement the power on service (see Power On Service). The DAEDT start request service primitive is originated by the SDTS user when it wishes to start the transmitters as part of a power-on sequence. Once started, the transmitters cannot be stopped under protocol control. Specifies the service primitive type. Always SDT_DAEDT_START_REQ. This primitive is only valid in the LMI_ENABLED management state and is valid when the DAEDT is in the IDLE state. The new DAEDT state is the IN-SERVICE state. This primitive does not require receipt acknowledgement. Successful: When successful, the primitive does not require receipt acknowledgement. The link state is unchanged. Unsuccessful (non-fatal errors): When unsuccessful, the SDTS provider negatively acknowledges the primitive using a LMI_ERROR_ACK primitive containing the error and reason for failure. The state remains unchanged. When the terminal is in the LMI_ENABLED management state and the DAEDT is already in the IN-SERVICE state, this primitive should be ignored and the SDTS provider should not generate a non-fatal error. The DAEDR start request service primitive is originated by the SDTS user when it wishes to start the receivers as part of a power-on sequence. Once started, the receivers cannot be stopped under protocol control. This primitive is a request from the Reception Control (RC) function in the SDTS user to the DAEDR function in the SDTS provider. Specifies the service primitive type. Always SDT_DAEDR_START_REQ. This primitive is only valid in the LMI_ENABLED management state and is valid when the DAEDR is in the IDLE state. The new DAEDR state is the IN-SERVICE state. When the terminal is in the LMI_ENABLED management state and the DAEDR is already in the IN-SERVICE state, this primitive should be ignored and the SDTS provider should not generate a non-fatal error. The data transfer service primitives provide the means for transfering data between SDTS users across a signalling data link. Data is sent and received in signal units. Signal units are the data contained in frames that occur between flags on the line excluding the checksum octets. These are packets of data that contain an integer number of octets (a multiple of 8 bits). When performing data transfer, signal units that are correctly received on the signalling data link are delivered to the SDTS user as they arrive. Signal units for transmission are delivered to the SDTS provider on demand, however, during quiescent periods it is sometimes advantageous from the point of view of synchronous driver design to request trasnmission of additional signal units in a pull arrangement rather than a push arrangement. Therefore there is a primitive to allow the SDTS provider to request additional data for trasnsmission. The DAEDT transmission request service primitive is originated by the SDTS user to request that the SDTS provider trasnmit a signal unit on the medium. A signal unit is a self-contained packet of data containing an integer number of octets of information. This primitive is a request from the Transmission Control (TXC) function in the SDTS user to the DAEDT function in the SDTS provider. Specifies the service primitive type. Always SDT_DAEDT_TRANSMISSION_REQ. This primitive is only valid in the LMI_ENABLED management state with the DAEDT in the IN-SERVICE state. This primitive should only be issued by the SDTS provider after the transmitters have been enabled with a SDT_DAEDT_START_REQ and the DAEDT is in the IN-SERVICE state. After the transmitter have been enabled while in the LMI_ENABLED management state, the DAEDT state is always appropriate for the SDTS user to issue this primitive. The M_PROTO message block is optional. The SDTS provider will be prepared to accept M_DATA message blocks from the SDTS user, without any M_PROTO message block, as service primitive of this type. Most narrowband SS7 SDTS providers peform what is known as SU repetition. When SUs that correspond to FISUs (Fill-In Signal Units) or LSSUs (Link Status Signal Units) which are sent continuously on the signalling link, the SDTS user need only send the first such signal unit. The SDTS provider will continuously repeat a FISU or LSSU, when appropriate,1 until the next signal unit is presented for transmission. To perform this function, a narrowband SS7 SDTS provider must know the protocol options associated with the signalling link (i.e. the size of the sequence numbers and length indicator). Activate or deactivation of SU Repeating is a provider-specific function. When the terminal is in the LMI_ENABLED management state, but the DAEDT is still in the IDLE state, the primitive should be ignored and the corresponding data discarded without generating a non-fatal error. The RC signal unit indication service primitive is issued by the SDTS provider when a signal unit arrives on the signalling data link and passes error detection. The primitive is named the ‘RC’ signal unit indication because this signal is normally sent to reception control (RC) within the SS7 Level 2 state machine. This primitive is an indication from the DAEDR function in the SDTS provider to the Reception Control (RC) function in the SDTS user. Indicates the service primitive type. Always SDT_RC_SIGNAL_UNIT_IND. When signal unit compression is in effect, this field contains a count of the number of compressed identical signal units (not counting the original). When signal unit compression is not in effect, or the signal unit was not compressed (it was not repeated on the line), this field is set to the value 0. This primitive is only issued from the LMI_ENABLED management state. The primitive is only issued when the signalling data terminal is in the LMI_ENABLED management state. Received signal units are indicated only after the receivers have been enabled using the SDT_DAEDR_START_REQ command and the DAEDR is in the IN-SERVICE state. Once the SDTS user is receiving signal units, it will continue to do so until a fatal error occurs, the stream is closed, or the signalling data terminal is disabled with the LMI_DISABLE_REQ primitive. The M_PROTO message block is optional and is only really required for indicating the count of compressed signal units. When signal unit compression is not in effect, or when a signal unit is not compressed (i.e. has a sdt_count of zero), the M_PROTO message block is unnecessary and SDTS providers are encouraged to not include it. When the M_PROTO message block is not included, the signal unit is delivered simply as a chain of one or more M_DATA message blocks to the SDTS user. The SDTS user must be prepared to receive RC signal unit indications consisting of only M_DATA message blocks. Most narrowband SS7 SDTS providers provider for signal unit compression. Under this scheme, the first non-identical signal unit is indicated with a sdt_count of zero. Should additional identical signal units be received, the will be counted until another non-identical signal unit is received. At that point, an RC signal unit indication with a sdt_count indicating the number of compressed signal units is indicated followed by an indication of the new non-identical signal unit with a sdt_count of zero. And the cycle repeats. To support this feature, SDTS users must be prepared to accept a compressed frame representing all of the contiguous identical signalling units in this fashion. For example, the SDTS user cannot rely by its design on the third identical signal unit causing a state transsition in a timely manner. Invocation and applicability of a signal unit compression feature is provider-specific. So, for example, Q.703 drivers use FISU and LSSU compression techniques, whereas, M2PA (RFC 4165) does not require them. This primitive does not require a response from the SDTS user. The TXC transmission request indication service primitive is originated by the SDTS provider to indicate that if a signal unit is not available for transmission that the signalling terminal will idle the signalling data link. Depending on the specific SDTS provider, idling the signalling data link may consist of idling continuous flags, FISUs or LSSUs. This indication provides timing ques to the SDTS user. This primitive is an indication from the DAEDT function in the SDTS provider to the Transmission Control (TXC) function in the SDTS user. Indicates the service primitive type. Always SDT_TXC_TRANSMISSION_REQUEST_IND. This primitive is only issued from the LMI_ENABLED management state and when the DAEDT is in the IN-SERVICE state. This service primitive is only issued when the signalling terminal is in the LMI_ENABLED management state. This service primitive is only issued when the DAEDT is in the IN-SERVICE state; that is, a SDT_DAEDT_START_REQ primitive has been received by the SDTS provider for the signalling terminal. This service primitive is only issued by the SDTS provider when its transmission queue is empty. This service primitive is only issued by the SDTS provider when the provider is configured to generate these indications. Configuration of the SDTS provider is a provider-specific matter. This primitive does not require a specific response from the SDTS user. Upon receiving this primitive, if the SDTS user does not wish the signalling data link to idle flags, FISUs or LSSUs, it should generate another trasnmission request using the SDT_DAEDT_TRANSMISSION_REQ primitive. The initial alignment service primitives peform the functions of the Alignment Error Rate Monitor (AERM). They provide the SDTS user with the ability to start and stop the AERM, set normal or emergency proving periods, and receive correct signal unit indications and indications that the error rate has exceeded the threshold. Not all SDTS providers implement nor require an AERM function. For example, broadband signalling links can be configured to not perform proving, in which case the AERM function is not necessary. Regardless of whether the AERM function is necessary or not, each SDTS provider should be prepared to handle requests and generate appropriate indications as though an AERM function existed, and without generating non-fatal errors. Note that some designs do no permit the AERM function and the SUERM or EIM function to be active simultaneously. These service primitives implement the initial alignment service (see Initial Alignment Service). The AERM start request service primitive is originated by the SDTS use to request that the Alignment Error Rate Monitor be started. This primitive is a request from the Initial Alignment Control (IAC) function in the SDTS user to the AERM function in the SDTS provider. Specifies the service primitive type. Always SDT_AERM_START_REQ. This primitive is only valid in the LMI_ENABLED management state and valid when the DAEDR function is in the IN-SERVICE state and the AERM function is in the IDLE state. The new state of the AERM function is the IN-SERVICE state. Successful: When successful, the primitive does not require receipt acknowledgement. The AERM function is moved to the IN-SERVICE state. When the signalling terminal is in the LMI_ENABLED management state, the DAEDR is in the IN-SERIVCE state and the AERM is already in the IN-SERVICE state, this service primitive should be ignored without generating a non-fatal error. Some STDS providers may generate a non-fatal error when the SUERM/EIM function is not in the IDLE state. The AERM set Ti to Tin request service primitive is originated by the SDTS user to request that the normal proving period be used for the current or next initial alignment error rate monitoring. This primitive is a request from the Initial Alignment Control (IAC) function in the SDTS user to the AERM function in the SDTS provider. Specifies the service primitive type. Always SDT_AERM_SET_TI_TO_TIN_REQ. This primitive is only valid in the LMI_ENABLED management state but may be issued in any signalling terminal state. The new state remains unchanged and normal proving is asserted. The AERM set Ti to Tie request service primitive is originated by the SDTS user to request that the emergency proving period be used for the current or next initial alignment error rate monitoring. This primitive is a request from the Initial Alignment Control (IAC) function in the SDTS user to the AERM function in the SDTS provider. Specifies the service primitive type. Always SDT_AERM_SET_TI_TO_TIE_REQ. The new state is unchanged and emergency proving is asserted. The IAC correct SU indication service primitive is issued by the SDTS provider during the intial alignment phase to indicate that a correct signal unit has been received. Some STDS user state machines require this primitive; others can use the SDT_RC_SIGNAL_UNIT_IND primitive in its stead. This primitive is an indication from the AERM function in the SDTS provider to the Initial Alignment Control (IAC) function in the SDTS user. Indicates the service primitive type. Always SDT_IAC_CORRECT_SU_IND. This primitive is only issued from the LMI_ENABLED management state and when the DAEDR function is in the IN-SERVICE state and the AERM function is in the IN-SERVICE state. It is only issued for the first correct signal unit received in this total state. The primitive is only issued when the signalling terminal is in the LMI_ENABLED management state. The primitive is only issued when the DEADR function is in the IN-SERVICE state. The primitive is only issued when the AERM function is in the IN-SERVICE state. The primitive is only issued for the first correct signal unit that is received in the appropriate states. Whether the primitive is issued in the appropriate state is SDTS provider-specific. Some SDTS providers may need configuration options set before this primitive will be issued. The SDTS user should be prepared to use a SDT_RC_SIGNAL_UNIT_IND primitive in its stead. This primitive does not require a specific response from the SDTS user. The IAC abort proving indication service primitive is issued by the SDTS provider to indicate that the error rate experience on the signalling data link has exceeded the operating threshold. This primitive is an indication from the AERM function in the SDTS provider to the Initial Alignment Control (IAC) function in the SDTS user. Indicates the service primitive type. Always SDT_IAC_ABORT_PROVING_IND. This primitive is only issued from the LMI_ENABLED management state with the DAEDR function in the IN-SERIVCE state and the AERM function in the IN-SERVICE state. The new AERM state is IDLE. The primitive is only issued when the DAEDR function is in the IN-SERVICE state. The primitive is only issued when the AERM function is in the IN-SERVICE state. After issuing the primitive the AERM is placed into the IDLE state. The primitive is only issued from the appropriate state when the error rate is detected as exceeding the operating threshold. The setting of the operating threshold is a SDTS provider-specific configuration matter. Not all SDTS providers have a fully functional AERM. Some providers may never issue this primitive. The AERM stop request service primitive is originated by the SDTS user to request that the AERM function be stopped (moved to the IDLE state). This primitive is a request from the Initial Alignment Control (IAC) function in the SDTS user to the AERM function in the SDTS provider. Specifies the service primitive type. Always SDT_AERM_STOP_REQ. This primitive is only valid in the LMI_ENABLED management state with the DAEDR function in the IN-SERVICE state and the AERM function in the IN-SERVICE state. The new state of the AERM function is the IDLE state. Successful: When successful, the primitive does not require receipt acknowledgement. The AERM state is moved to the IDLE state. When the signalling terminal is in the LMI_ENABLED management state and the AERM function is already in the IDLE state, this primitive should be ignored and no non-fatal error generated. The error rate monitoring service primitives perform the functions of the Signal Unit Error Rate Monitor (SUERM) or Errored Interval Monitor (EIM). They provide the SDTS user with the ability to start and stop the SUERM/EIM, and receive indications that the error rate has exceeded the operating threshold. Not all SDTS providers implement nor require a SUERM/EIM function. Regardless of whether the SUERM/EIM function is necessary or not, each SDTS provider should be prepared to handle requests and generate appropriate indications as though a SUERM or EIM function existed, and without generating non-fatal errors. These service primitives implement the error rate monitoring service (see Error Rate Monitoring Service). This SDTS user originated primitive is used to start the Signal Unit Error Rate Monitor (SUERM) or Errorred Interval Monitor (EIM) service. This primitive is a request from the Link State Control (LSC) function in the SDTS user to the SUERM/EIM function in the SDTS provider. Specifies the service primitive type. Always SDT_SUERM_START_REQ. This primitive is only valid in the LMI_ENABLED management state, when the DAEDR is in the IN-SERVICE state, when the AERM is in the IDLE state and when the SUERM/EIM is in the IDLE state. The new management state remains unchanged. The state of the SUERM is moved to IN-SERVICE state. Successful: When successful, the primitive is not acknowledged. The SUERM/EIM function is moved to the IN-SERVICE state. Unsuccessful (non-fatal errors): When unsuccessful, the SDTS provider responds with a LMI_ERROR_ACK primitive containing the error. When the signalling terminal is in the LMI_ENABLED state and the SUERM/EIM function is already in the IN-SERVICE state, this primitive should be ignored without generating a non-fatal error. This SDTS provider originated primitive is issued by the SDTS provider while the SUERM/EIM service is active to indicate that the error rate monitor has detected errors that exceed the configured threshold and that the link should be failed for execessive errors. This primitive is an indication from the SUERM/EIM function in the SDTS provider to the Link State Control (LSC) function in the SDTS user. Indicates the service primitive type. Always SDT_LSC_LINK_FAILURE_IND. This primitive will only be issued when the signalling terminal is in the LMI_ENABLED management state and the SUERM/EIM is in the IN-SERVICE state. The new state for the SUERM is the IDLE state. The SDTS provider will only issue an SDT_LSC_LINK_FAILURE_IND primitive while the SUERM or EIM is in the IN-SERVICE state and the monitored error rate exceeds the operating threshold configured for the error monitor. After issuing the primitive, the SUERM is placed in the IDLE state. Not all STDS providers have a fully functional SUERM/EIM. Some providers may never issue this primitive. This SDTS user originated primitive is used to stop the Signal Unit Error Rate Monitor (SUERM) or Errorred Interval Monitor (EIM) service. This primitive is a request from the Link State Control (LSC) function in the SDTS user to the SUERM/EIM function in the SDTS provider. Specifies the service primitive type. Always SDT_SUERM_STOP_REQ. This primitive is only valid in the LMI_ENABLED management state, and when the SUERM/EIM is in the IN-SERVICE state. The state of the SUERM/EIM is moved to IDLE state. Successful: When successful, the primitive is not acknowledged. The SUERM function is moved to the IDLE state. Unsuccessful (non-fatal errors): When unsuccessful, the SDTS provider responds with a LMI_ERROR_ACK primitive containing the error. The state remains unchanged. When the signalling terminal is in the LMI_ENABLED management state and the SUERM/EIM is already in the IDLE state, this primitive should be ignored without generating a non-fatal error. The receive congestion service primitives provide the SDTS user with the ability to be informed by the SDTS provider when it detects receive congestion conditions and can determine a receive congestion policy. Receive congestion is a provider-specific matter. The SDTS user is also capable of detecting receive congestion without the assistance of these primitives. They are used to indicate receive congestion to the SDTS user that can only be detected within the SDTS provider. These service primitives implement the receive congestion service (see Receive Congestion Service). The RC convestion accept indication service primitive is indicated by the SDTS provider when it is experiencing receive congestion but signal units continue to be delivered by the SDTS provider. This primitive is an indication from a provider-specific function in the SDTS provider to the Reception Control (RC) function in the SDTS user. Indicates the service primitive type. Always SDT_RC_CONGESTION_ACCEPT_IND. This primitive is only issued when the signalling terminal is in the LMI_ENABLED management state and the DAEDR function is in the IN-SERVICE state. The receive congestion state is moved to CONGESTION-ACCEPT. This primitive is only issued when the signalling terminal is in the LMI_ENABLED management state, the DAEDR function is in the IN-SERVICE state, and the SDTS provider has detected receive congestion but is not discarding signal units. Not all SDTS providers have a fully functional receive congestion function. Some SDTS providers may never generate this primitive. The RC convestion discard indication service primitive is indicated by the SDTS provider when it is experiencing receive congestion and signal units are being discarded by the SDTS provider. This primitive is an indication from a provider-specific function in the SDTS provider to the Reception Control (RC) function in the SDTS user. Indicates the service primitive type. Always SDT_RC_CONGESTION_DISCARD_IND. The receive congestion state is moved to CONGESTION-DISCARD. This primitive is only issued when the signalling terminal is in the LMI_ENABLED management state, the DAEDR function is in the IN-SERVICE state, and the SDTS provider has detected receive congestion and is discarding signal units. This SDTS provider originated primitive This primitive is an indication from a provider-specific function in the SDTS provider to the Reception Control (RC) function in the SDTS user. Indicates the service primitive type. Always SDT_RC_NO_CONGESTION_IND. The receive congestion state is moved to NO-CONGESTION. This primitive is only issued when the signalling terminal is in the LMI_ENABLED management state, the DAEDR function is in the IN-SERVICE state, and the SDTS provider has detected that receive congestion has abated. Two error handling facilities should be provided to the SDTS user: one to handle non-fatal errors, and the other to handle fatal errors. These are errors that do not change the state of the SDTS interface as seen by the SDTS user and provide the user with the option of reissuing the SDT primitive with the corrected options specification. The non-fatal error handling is provided only to those primitives that require acknowledgements, and uses the LMI_ERROR_ACK to report these errors. These errors retain the state of the SDTS interface the same as it was before the SDT provider received the primitive that was in error. Syntax errors and rule violations are reported via the non-fatal error handling facility. These errors are issued by the SDT provider when it detects errors that are not correctable by the SDT user, or if it is unable to report a correctible error to the SDTS user. Fatal errors are indicated via the STREAMS message type M_ERROR with the UNIX system error EPROTO. The M_ERROR STREAMS message type will result in the failure of all the UNIX system calls on the stream. The SDTS user can recover from a fatal error by having all the processes close the files associated with the stream, and then reopening them for processing. * primitives defined elsewhere <sys/ss7/lmi.h>. A grouping of SDT user data whose boundaries are preserved from one end of the signalling data terminal connection to the other. The phase in connection and connectionless modes that supports the transfer of data between to signalling data terminal users. 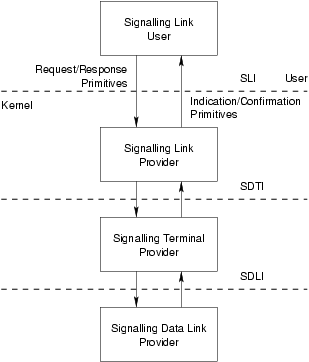 The signalling data terminal layer protocol that provides the services of the signalling data terminal interface. The user-level application or user-level or kernel-level protocol that accesses the services of the signalling data terminal layer. The phase in connection and connectionless modes in which a SDT user initializes a stream and attaches a PPA address to the stream. Primitives in this phase generate local operations only. Note that the only LSSU that is not repeated continuously is the SIB.